There is no 'one size fits all' approach to innovation. It's about designing an approach that works for your organisation. The below principles help. Let's face it, large organisations are often slow when it comes to bringing new products and services to market. Inspired by how start-ups operate they believe they simply have to speed up in order to be successful. This is not true. Yes, speed matters, but it's not about how fast you can launch a new product or service - it's about how fast you can learn what works and what doesn't. The good news is that you can do most of your learning relatively risk-free. The diverge-converge process helps you to make sure you are designing the right thing before designing things right. Innovation happens at the sweet spot where user needs (desirability), technology (feasibility) and business value (viability) intersect. Innovation is not an exercise. It is not something you can outsource or delegate to a service provider and then implement. For innovation to have a lasting impact it's principles need to be engrained in the way of working and the culture of your organisation. Teams of five to eight people can solve very complex challenges in a couple of weeks - if they are empowered to do so. Experiencing how a messy challenge turns into a tangible solution that customers are willing to pay for is deeply satisfying and rewarding. This is the first step towards cultural change. Innovation is difficult and especially in the beginning uncertainty is high. High uncertainty, not knowing what the right solution is makes people feel uncomfortable. As a result we tend to jump to solutions without fully understanding the problem. Often someone makes an ad hoc decision based on an opinion or a gut feeling. This is the recipe for failure. I navigate teams through the messy phases of innovation and I help them get comfortable with uncertainty. We take the guesswork out of decision making by conducting user research and testing concepts early. Dr. Sebastian Vetter is an international management consultant specialised in strategy and innovation. Over the last 12 years he has worked with leading organisations in New Zealand and Europe from a diverse range of industries: telecommunications, finance, education, retail, agriculture, high-tech manufacturing, energy, aviation, automotive, transport, government organisations, and start-ups. Sebastian is an unconventional strategic thinker with deep methodology expertise. He is highly skilled at navigating teams through messy problems and complex challenges. He is an effective coach and facilitator from shop floor to c-level and he gets stuff done. Sebastian is a lecturer for design thinking at the Institute for Multimedia and Interactive Systems (IMIS) at Lübeck University. Get your hand on this great book by Erich Bühler. I wrote a story on how to design strategies in a world that is increasingly volatile, uncertain, complex, and ambiguous (VUCA). McKinsey's famous 3-Horizon's model of growth (in short: defend, expand, disrupt) differentiates tactics for each horizon (superior execution, positional advantage, insight and foresight). Most organisations focus on H1, maybe H2 and underinvest in H3. In order to remain relevant organisations have to start creating viable options for the future today. Many organisations spend a lot of money on creating fancy open office spaces with bean bags, digital gadgets and nerf guns. At the same time they gain little value from teams that struggle to do focused work in a distracted playground environment. You need less than you think in order to create an environment for creativity and innovation. Many service providers believe they are selling products instead of services. Organisations with a product-centric mindset tend to operate in silos, as a result their services are often fragmented and disconnected. Great services are co-created by customers and the service provider, they are 'consumed' over time via multiple touchpoints. Five year strategies are obsolete. Customer behaviours and expectations are changing faster than ever. Multinational players and small start-ups enter and disrupt traditional markets, changing the rules of the game and competing for customers and talent. 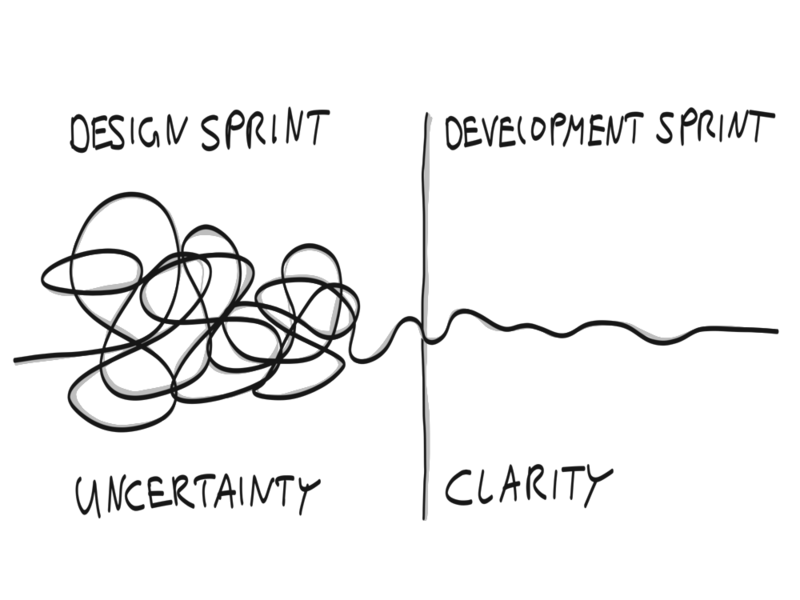 Strategy design is about designing an organisation that can sense, respond and adapt to future challenges. Create a new product or service offering in just a few weeks. Originally developed by Google Ventures as a tool for start-ups this process is battle tested, fast, fun and productive. How do you know you're building the right thing? I recommend running Sprints early to test and define the customer value proposition of your product or service. Unfortunately in many organisations design thinking is limited to the annual 2-day workshop. Being able to apply design thinking to the real world where problems are complex and decisions political requires practice and experience. Bring in an experienced design thinking facilitator (that's me) and work on a real problem you are facing. In the last 12 years I have worked with organisations from nearly all industries on innovation, strategy, customer experience and organisational development. I’m an expert-generalist with an interest in art, design and mental models. Call me +49 (0) 176 5699 0472, send me an email sebastian@innovate-strategy.com or fill in the below form. Part 2: You're building or managing an innovation hub? This post is for you! In 2017 I published 10 lessons learned when building or managing innovation hubs and the feedback was overwhelming. The article was viewed by more than 10.000 people and I received emails from all over the world. Requests came from the US Airforce, startups from Kenya and Nigeria, medical corporations from Switzerland, New Zealand Universities, public sector organisations in the UK, and banks in the Middle East. Part 1: You’re building or managing an innovation hub? This post is for you! Innovation hubs – the buzzword of buzzwords. Every organisation wants one, all the big names have one. The promise sounds great – a space that fosters innovation. But do they deliver? And what differentiates successful from underperforming innovation hubs? I helped organisations in New Zealand and Europe build, manage, and operate innovation hubs and my answer is: yes, some innovation hubs do really well. Learn from my #10 lessons learned and increase the productivity of your innovation hub. Uber Technologies Inc, the world’s largest provider of personal transport has surely made it into the top 10 of water-cooler conversations. Digital, technology and disruption are frequently used buzzwords when telling the Uber story. Uber was founded in 2009 and is currently present in 60 countries and more than 300 cities. Despite extensive media coverage (mostly about countries who are trying to ban Uber), few people actually understand what makes Uber successful. Even most conventional taxi drivers fail to understand how Uber manages to offer a service with drivers who don’t have a taxi licence. Many believe it is innovative digital technology that allowed Uber to disrupt the taxi industry. It is not! Unlike products, services are delivered over time through a series of interactions between a customer and a service provider, which we call touchpoints. Service companies are typically structured around channels e.g. digital, direct, phone etc. As a result of this the budget is also assigned in the same way. To visualise this, the below sketch shows the structure of a prototypical service company. You might think of your work in the context of a particular channel. Important to bear in mind is that your customers don’t care about channels or how your company is structured. Every interaction they have forms their experience regardless of channels. Their interactions are driven by a specific need or goal they want to achieve. This blog is triggered by a personal experience I recently had with a German telecommunications company. I will use my example to illustrate a common problem in the telecommunications (and service) industry and I will provide practical tips on how to fix it. The good news is that it can be fixed and that the benefits in terms of cost savings and customer experience are huge.